Apples of Gold Jewelry offers this beautiful heart-shaped garnet solitaire bezel-set ring in white gold, complete with a beautiful genuine garnet gemstone in the center. The lovely garnet gemstone, which is heart shaped and 4mm by 4mm in size, is a deep crimson red color that goes wonderfully with your choice of either 10K or 14K white gold. The setting height on the ring is 6mm. 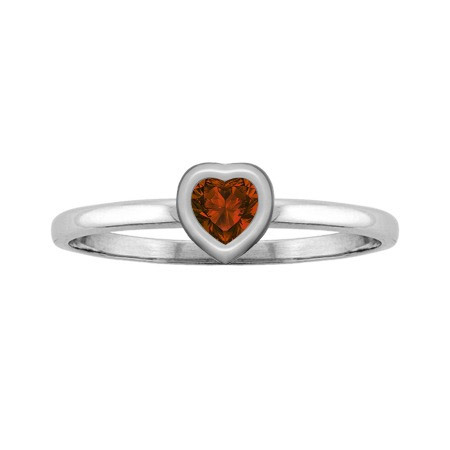 The band of the ring is a polished white gold, and the outside of the heart on the gemstone has a slight bezel setting to give the ring a bit of style. The beautiful ring makes a perfect addition to any jewelry collection, whether it be a gift for a piece of birthstone jewelry or even a different take on an engagement ring. We guarantee our Heart-Shaped Garnet Solitaire Bezel-Set Ring in White Gold to be high quality, authentic jewelry, as described above.